BELGRADE (Sputnik) — The Bosnian Serbs are asking Russia to veto the adoption of the UK initiated resolution on the events in Srebrenica in the UN Security Council, president of the Republika Srpska (Bosnia and Herzegovina) Milorad Dodik said Sunday. "Of course, we ask Russia to veto [the British resolution] because that is directed towards the truth," Dodik told reporters. According to Dodik, the Britain proposed the draft of the resolution in the attempt to "clean its conscience" for all its negative influence around the world, but it will only "pin the label of genocide on the unborn Serbian children" and bring to the disintegration of Bosnia and Herzegovina. "Those who once destroyed Yugoslavia are now trying to destroy the Republika Srpska", Dodik said. Earlier on Sunday, Serbian President Tomislav Nikolic also asked Russia to veto the British resolution on Srebrenica massacre in a letter he sent to Russian leader Vladimir Putin. 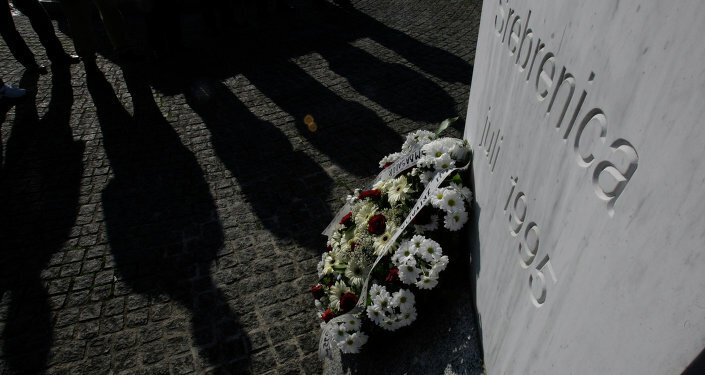 The draft resolution is expected to be considered by the UN Security Council on July 7, on the occasion on the 20th anniversary of the killings in the Bosnian town of Srebrenica committed by the Army of Republika Srpska on July 11, 1995.
International Criminal Tribunal for the former Yugoslavia (ICTY) and the International Court of Justice has classified the massacre in Srebrenica as genocide. Serbia and the Bosnian Serbs do not deny the crime, but do not refer to them as genocide.